Greetings Stationeers fans! Last week and over the weekend the developers have implemented some cool stuff! From optimizations to new additions, the last update had it all. As always we have left a full list of the changes below. Let's get into some of the important features in case you missed it! You can catch the features in full detail here. This week is you can now undock inventory windows and move them freely around your screen. You will be able to lock and dock the screens wherever you would like. There is a button in the general settings screen, just in case you want to set the screen back to default. The locations will be saved with your game and restored upon loading back in. Some improvements to the ladder system were made as well. You will now be able to build a floor piece that has a small hole to allow the ladder to pass through. Making it easy to build multiple floors. This feature has been a much-requested feature by the community.You will now have the option to build a smaller locker variant. This will be buildable from the Locker Kit. Added advanced airlock control circuitboard. Allows assignment of an internal and external door, with a matching internal and external pump. You can set the internal and external pressure that will be met. When cycling the circuitboard will completely clear the room with its designated vent, before refilling the room with the designated pump. Useful for airlocks in environments where you have matching, but different, atmospheres instead of vacuums. Added Ladder End and Ladder Platform, buildable off the Ladder kit. Place these to have intermediary floors you can get off at. Press jump key to get off at intermediate floors. Ladder end makes it easier to get on a ladder above a ladder platform. Added voice notifications for Jetpack, Air Tank, and Filters. Added small locker. This holds only four slots, and is constructed as a variant of Kit (Locker). Changed Kit (Locker) to use 2 kits when constructing the large locker, small locker will only use 1 kit. Added first pass of mouse control of world slots and interactions. With mouse control enabled, you can now directly interact with slots and interactables in the world. Such as opening a crate, and swapping items in your inventory with it. Added Filtration Machines and Suits will not display Filter error state for a used up filter, if another filter of the same type that is not used up exists. Added Unloader. Will empty all slots of the provided item. Constructed from stacker kit. Added first pass of turbine generator. Generates 90W of energy from 1 atmosphere of pressure moving through it. Moves up to 1 atm per tick, so capable of generating 180W per second. Added Headlamp that provides illumination without having to wear a helmet. Added Mining Drill "flatten" mode. When turned to flatten, the drill will not destroy terrain lower than the position the player is at. This is useful if you want to perfectly flatten an area around you. Default mode is the current mode. This can be toggled in the interaction menu for the drill. 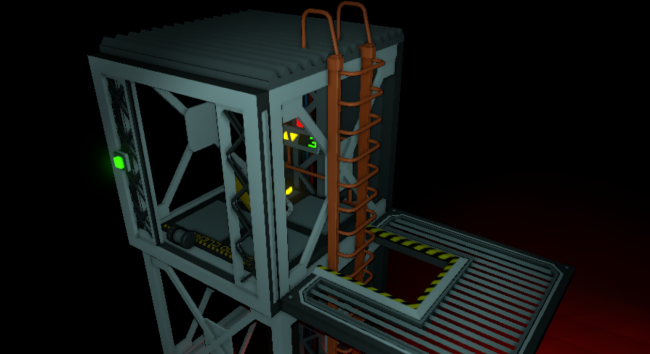 Added sound effects to elevator. Added sounds to jetpack for movement. Added warning and critical status indicators for Air Tank low, when wearing a suit. Voice notifications to follow later. Added filter caution and critical visual warnings (audio to be recorded). Will show when suit worn that does not contain a filter or contains empty or low filters. Added fitration machine and scrubber will now report errors if they contain a filter than is fully spent. Added can use crowbar to force open unpowered and unlocked elevator level doors. Changed Gas Filters to be a consumable. Each Gas Filter will last roughly 2 hours. We will introduce different gas filters that will last longer. Once they reach zero they will be useless, but can be recycled. Added PowerGenerated logic variable. This reports how much power is being generated currently on the device. Added to the Solid, Gas, and Turbine generators. Added new modes for solar sensor - horizontal and vertical angles. Mode 1 is horizontal, mode 2 is vertical. Added undock ability for Inventory Windows. Click and drag the window title bar of the window you want to move, and let go where you want it. This slot will always open there now. This will persist with your save. If you would like to redock the window, click the redock button and it will return to its original location. You can reset the window position in the Settings menu if they get off screen for any reason. Added Close All Windows button, that also indicates what current control binding for it is. Only shows while a window is open. Added new UI for Inventory Windows. Added new math functions to Unary Math Logic: Sin, Cos, Tan, Asin, Acos, Atan. Did not imagine people would have needed these but they might come in handy with required trig for different solar angles. Added new math functions to Math Processor. Atan2 (y = input2, x = input1), Pow, and log just because. Again these will be useful to mathematicians who want to auto orientate their solars. Added scaled environment damage to lungs. Will take damage faster the hotter/colder it is. Added efficiency to suit based on damage. The more damaged the suit, the less efficiently it will work. Added slot status icons for item on fire, and item leaking. Added a recoil force to firearms that will push you back. Most noticeable in low or zero gravity. Added tooltip to Construction indicating how to use Autoconnect when multiconstructing. Autoconnect how makes an attempt when you first activate it. Tweaked Hardsuit. Now able to heat/cool up to twice as much as the normal suit, but it will use twice as much energy in doing so. Added auto-rotation support to a large range of devices including Hydroponics Trays, Valves, Passive Vents, Pressure Regulators and more. Buffed Portable Air Conditioner. It will now be 5x more effective at heating, but it will use power 5x more in doing so. This simply means it is faster at heating. Adjusted jump to provide a more consistent result. Added Milk can be made at the Chemistry Station from Fenoxitone (ground up fern) and Soy Oil. Added Heal Pill and Stun Pill can be made at Chemistry station from Potassium Iodide, Electrum, Silver, and Invar. Exact recipes look up EReader Cartridge. Note: Powders for minerals must be made using Ingots at the Reagent Grinder. Added Suit Storage kit to Pipe Bender. Added Ladder Kit to Autolathe. Added Spacesuit creation to Autolathe, to allow replacement spacesuits. Added Microwave and Reagent Processor to Electronics Printer. Added Hardsuit to Electronics Printer, so you can make it there as well. Changed Logic Math and Unary Math to take in degrees, not radians. They were previously changed to output degrees, but they were still taking in radians. Now you will need to pass in degrees and you will also get out degrees. Changed suit to report error when filter used up or if when worn on entity it has a bad atmosphere. Changed filters to only get used when actually filtering something. If it is not filtering something, it will not degrade. Changed quantity for Milk and SoyOil. This will cause old saves to load very low quantities of these. They were changed in line with the refactor of the reagent system. Changed cereal bar recipe to require 150g of Flour. Changed Flour, Milk, and SoyOil to display the quantities of their units, not the percentage remaining. Changed Cos, Sin, Tan, Asin, Acos, Atan, Atan2 to output in degrees not radians. Note: This will completely change logic if you were basing them on radians. Changed power consumation rate of Volume pump. It will use power based on it's setting. Changed Batteries and Battery cells so that they will drain power slowly when in freezing environments. They will still lose power inside other things (such as a suit), but they will lose less power based on how insulated their parent is. Changed Gas Generator to require particular atmospheric operating conditions. A min and max temperature, and a minimum pressure. Outside of these the generator will shut down. Also, it now outputs only some of the combusted energy as power, the rest is outputted as heat into the waste pipe. Tweaked character movement controller, fixing the "launching" in air when up against an item or the terrain. Jumping is now also more like how it was. If you are close to the ground, the jump is basically the same on all planets. However, if you jump off terrain into the air it will depend on the gravity of the planet. Removed unloading ability from stacker. Refactored Reagent Processor and Chemistry station to support new medical recipes. Fern and some ingots can now be ground into powder using the Reagent Processor. This can then be used in the Chemistry Station to make various new recipes for medicine. Moved recipe for Hardsuit and Hardsuit Helmet from Electronics Printer, to the Tool Manufactory. Changed Standard spacesuit and helmet will now catch of fire in a hot environment. Use hardsuit in dangerous environments. Fixed gas filters providing too much when recycled. Fixed NullReferenceException when placing an elevator due to linked sound issue. 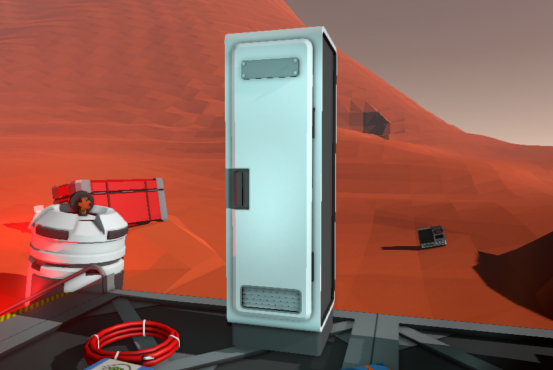 Fixed Airlock Control would open/close doors randomly on network changes and power loss. Now will initialize with it's previous state. Fixed rotation of battery charger and active vent. Fixed Pipe Meter, Pipe Analyser, and Gas Generator reporting in incorrect units. Fixed issue where construction cursor could remain up despite changing hands, dropping the construction kit or moving it using the mouse. Fixed voice notifications running on load of the game. Fixed World atmosphere being created when deconstruction a grid, causing room to get very cold on Europa. Fixed issue with pipes not exploding at high pressures due to a change in random chance calculation. Fixed ladders launching you forward when you get off them. Fixed incorrect radian conversion with new math functions. Fixed coal not outputting any gas when used in the solid generator. Now outputs hot CO2 and pollutant when used in solid gen. Fixed Orientation of screens on angled consoles. Fixed exceptions when connecting to dedicated server. Fixed Gas Filters would continue to exist even after being negative, achieved by putting them in the Arc Furnace. Fixed Battery and Battery Cells could go into negative with quantity of energy. Now clamped so they will not dip below zero and then take much longer to charge. Fixed getting stuck after jumping or walking, often on the edge of frames, or the edge of objects (such as containers). Fixed not enough reagents in tutorial to complete recipe creation task. Fixed bug when reverb not set correctly for items on load or player join server. Now reverb is correctly set when loading into a helmet. Fixed slight drift on jetpack when stabilizer active. Now stabilizer will keep the player stationary to the best of it's ability. Fixed when adding reagents to microwave (or chem station) when below the use quantity, the full quantity was added. Now scales reagents added if quantity is below use quantity. Fixed Nutrition full indicator would get stuck on warning indicator. Fixed recycling used Filters would output unlimited quantity of materials. Fixed suits still using their atmospheric functions while in the suit storage. Now processing will be paused while in suit storage. Suit and helmet atmospheres will also be purged while in suit storage. Fixed tooltip position becoming offset wrong. Fixed batteries in low pressure environments were still taking cold damage at same rate. Now scales down below one atmosphere. This means on mars, the battery loss rate due to cold will be about 3% of what it would be in a cold room or on Europa. Fixed cursor tooltip remaining on. Fixed respawn breaking inventory for clients and host. Now inventory windows will work correctly even after your body has decayed. Fixed Chute Outlet now pays attention to both chute and data when using automatic rotation. Fixed Chute Inlet now pays attention to both Chute and Data for automatic rotation. Fixed Composite Roll covers breaking logic when placed over top of them, and networks were reset. They would be registered as devices and take over the assignments for the logic. Now they are registered correctly as Other. Fixed Stacker locking out when filled with over 500 ingots. Fixed Inventory Windows able to be dragged out of bounds. Now cannot drag inventory window outside of window canvas. Fixed performance issues with rebuilding and merging large networks. Community team on Discord provided a new solution that is very optimized compared to old one. This should reduce the lag when merging large cable, pipe, and chute networks. (Credit: #modding on Discord). Fixed major bugs with atmosphere and room generation. Sometimes when voxel changes were registered (through mining) in an enclosed space, a global atmosphere was incorrectly created - causing the inhalation of the existing room. A number of checks and balances have been implemented now to prevent this occuring. Note: while mining voxels you may release small pockets of the global atmosphere. This means that you will notice some changes in temperature as you mine areas out, but it should no longer initiate catastrophic loss of rooms. NOTE: known bug is airlocks failing to always initiate room generation. Fixed construction not cancelled when pressing MouseControl, causing bugs. Now construction is cancelled automatically when player activates MouseControl. Fixed Wall Iron has wrong blueprint grid bounds, was displaying a box in a grid instead of the bounding box of the wall. Fixed atmospheric exception associated with Pipe bursting. Showed as a "max lower than min" error, causing an atmospheric exception that was unrecoverable. Fixed atmospheres able to be loaded with extreme values. When an error occurs with the atmospheric system, it was possible extreme values could end up stored as junk. Now the game will detect these and strip them on load. Fixed atmospheres able to exist in invalid locations. For some reason, atmospheres have been able to continue existing when they should not, such as under frames. Now the atmospheric manager will check for these, and schedule them for destruction if needed. This is a bandaid fix, a more elegant solution will come later. Fixed able to interact with export slot on Pipe Bender. Now it is not interactable. Fixed ladders able to be placed on top of each other. Now must be placed separately. They will not collide with anything else. Fixed bug with not being able to get off ladders. Fixed null ref when loading into a game where no button had previously been scrolled too. Fixed day was ten times longer than it should have been. Now back to regular settings. Updated translation text for Spanish, Japanese, Russian, Simplified Chinese, Traditional Chinese.